In the past week, there have been several successful demonstrations of terabit super-channel transmission using ultra-narrow channel spacings, which can increase overall system capacity by an additional 50 per cent compared to today’s commercial systems. ADVA Optical Networking and T-Systems, the systems and services division of Deutsche Telekom, took part in the ‘Terabit Demonstrator’ project, which was designed to showcase terabit transmission over a distance in excess of 1,000km in a software defined networking (SDN) environment. Meanwhile, Huawei and Proximus (formerly Belgacom) reported that terabit transmission had been achieved over a distance of 1,040km on the Belgian operator’s backbone network – the first time that Huawei’s super-channel OTN card has been tested in the field. First, let’s look at the Terabit Demonstrator. This is one of the projects being carried out under the €80 million SASER (Safe and Secure European Routing) European research cluster, whose work comes to an end in September 2015. Other sub-projects from the same initiative have also recently announced results (see Orange reaches record 38.4T transmission in the C-band). The terabit transmission took place over T-Labs' SASER optical testbed connecting high-performance computing centres in Dresden and Stuttgart. The optical testbed was built with technology from Alcatel-Lucent, while ADVA Optical Networking supplied the 100G coherent transceivers for the demonstration. The use of 33GHz ultra-narrow channel spacing technology with its coherent transceivers represents a major breakthrough, according to ADVA. “The technological advancements on display here are enormous,” said Stephan Neidlinger, vice president, strategic alliance management, ADVA. “Our products are just one example. We've pushed our 100Gb/s coherent technology to a channel spacing that is 33 per cent tighter than today's current standard. This means that we're increasing the capacity of existing fibre networks by 50 per cent. Such a leap in spectral efficiency is no small task and the implications are significant. 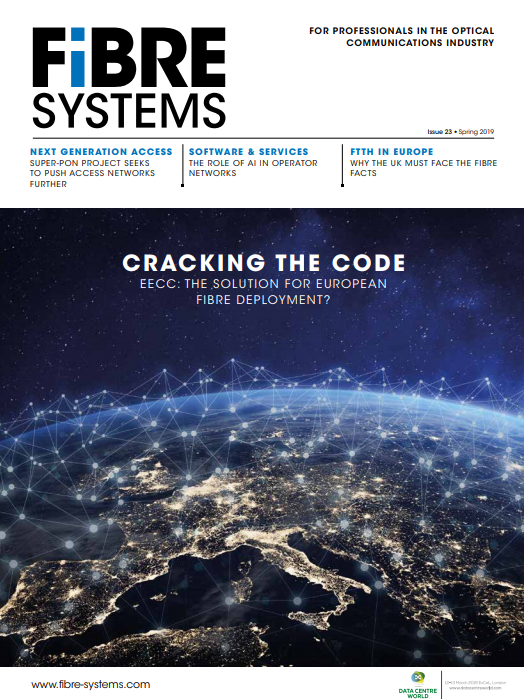 Our global engineering team has worked extensively with T-Systems to develop this breakthrough and to successfully deploy it in this terabit network." The demonstration's sheer capacity is matched by its incredible flexibility, he adds. T-Systems is using SDN and virtualised network functions to show how programmability can be used in advanced networks. Multi-vendor interoperability is a critical component that underpins this kind of flexibility. ADVA has engineered its coherent optical products to work transparently across other vendors' equipment without the need for any electronic processing. In related news, Proximus and Huawei have successfully completed a joint trial showing super-channel speeds of up to one terabit over the operator’s backbone network. The trial is the first outcome of the innovation partnership that the Belgian operator and Huawei entered into in six months ago. The test achieved its purpose, which was to determine whether this technology can be integrated into Proximus’ core network, in response to the constant and growing demand for bandwidth. Via Huawei’s new super-channel line cards, Proximus will be able to increase its optical backbone capacity with 200Gb/s channels, and can evolve to 400Gb/s channels and 1Tb/s super-channels in the future. The terabit transmission was conducted over a 1,040km fibre link using a ‘Flexgrid’ capability on Huawei’s OSN 9800 OTN platform. This approach increases the capacity on a fibre cable by compressing the gaps between transmission channels, boosting total transmission capacity by a further 50 per cent. By reusing the existing optical platform, chassis and slot, this will allow the total transmission capacity of Proximus’ core network links to increase from 16Tb/s to 20Tb/s. “At Proximus we pledge to satisfy the evolving customers demand by investing in new technologies to offer them the best quality and service. Together with Huawei we want to let our network infrastructure evolve to support current and future bandwidth demands and offer our customers an outstanding user experience,” says Geert Standaert, Chief Technology Officer at Proximus.